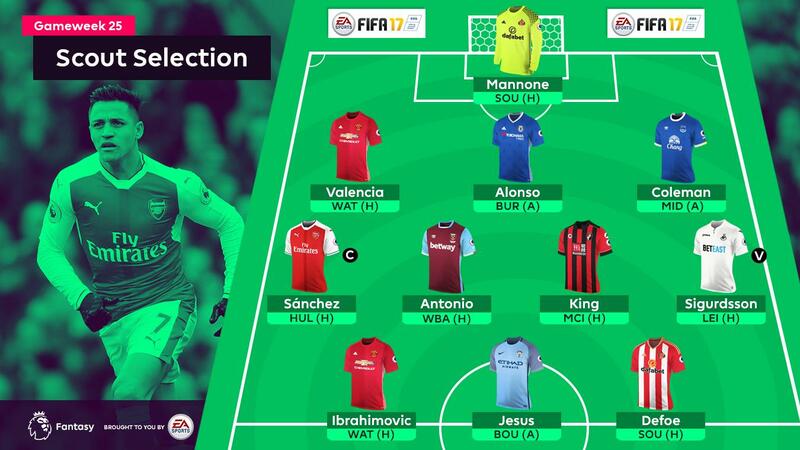 A 93-point haul from Gameweek 24 marked a return to form for the Scout Selection, putting added pressure on this weekend's XI to perform. Reliant on Romelu Lukaku's (£9.8m) four goals and 21 points for Everton last time out, we now look to our midfield to provide a cutting edge. 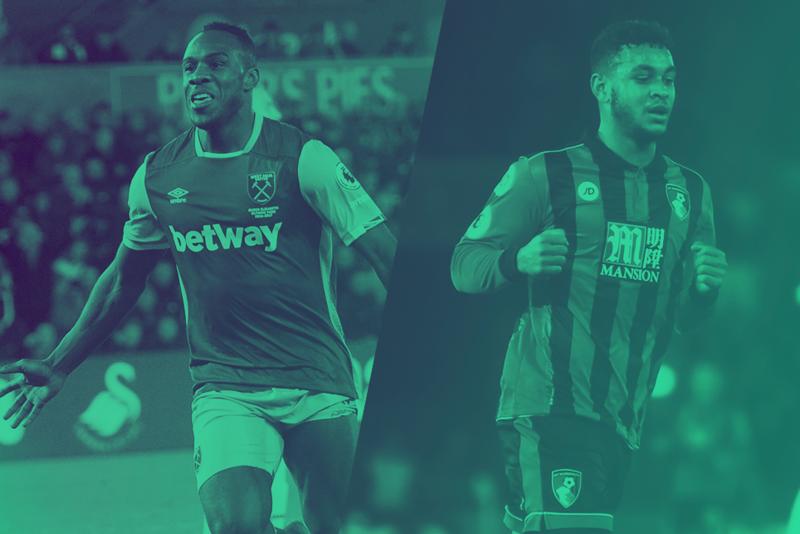 West Ham United's Michail Antonio (£7.0m) and AFC Bournemouth's Joshua King (£5.3m) offer handy mid-price solutions, afforded central striker roles ahead of home matches. Now threatened by the return of Jordan Pickford (£4.1m), the Italian remains a solid short-term pick ahead of the visit of Southampton. Since being installed to the starting line-up in Gameweek 19, no other goalkeeper has made more saves than Mannone's tally of 32. With a pair of assists over the last four Gameweeks, the Ecuadorian is finally delivering on his promise. Having provided more successful crosses (36) than any other FPL defender, we are expecting more to come, starting in Saturday's Old Trafford meeting with Watford. Alonso has provided either a clean sheet, a goal or an assist in 15 of his 18 Gameweek starts. Sunday's trip to Burnley could extend that run with the Chelsea defence conceding just 10 goals in 12 away trips as the Premier League's top-ranked defence. Ronald Koeman may well revert to a three-man defence at Middlesbrough, unleashing Coleman in a right wing-back role. Embracing that attacking freedom, he has delivered in each of his last four Gameweeks, providing a goal and three assists. Hull City will present a stubborn barrier at Emirates Stadium. But Sanchez will be the key threat to Marco Silva's disciplined defence and, with a goal or an assist in 10 of his last 12 Gameweeks, we again look to the Chilean as our Gameweek captain. Two-thirds of the Hammers' goals at the London Stadium have been either scored or assisted by Antonio. Set for a role up front against West Bromwich Albion, he faces a backline that has kept just a single clean sheet on the road all season. 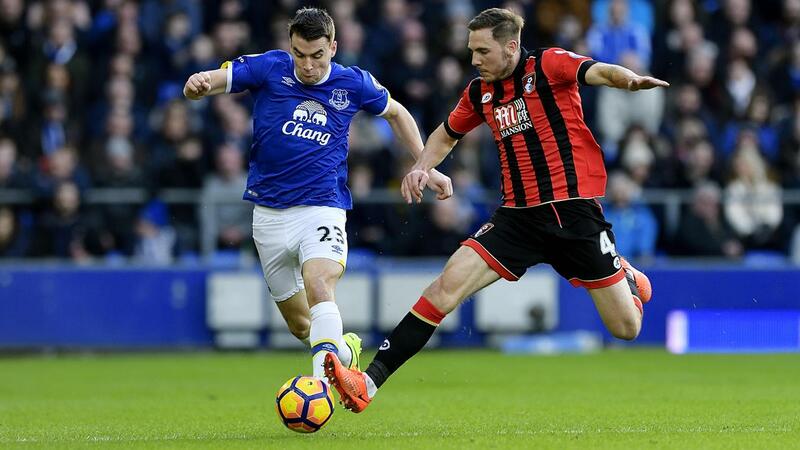 Another FPL midfielder likely to be fielded as a central striker, the Cherries will look to King to trouble the Manchester City defence after he notched twice in their 6-3 reverse at Everton. Eddie Howe's side scored four goals against Liverpool and three in the defeat to Arsenal in recent home matches, so attack may well be the most effective form of defence in Monday night's encounter. A role on the left of the Swans front three has done little to hinder the Icelander's FPL potential ahead of a home meeting with Leicester City. With set-piece duties, penalties and a considerable threat from range, Sigurdsson has supplied three goals and two assists in the five Gameweeks under Paul Clement. Cementing his status as the top-value FPL forward with a brace at Selhurst Park, Defoe takes electric form into a meeting with a Southampton side with six defeats in their last seven outings. Virgil van Dijk's (£5.7m) absence is a big loss for the Saints and, without him, they may struggle to shackle the lively Defoe. Resuming normal service with a goal at Leicester City, Ibrahimovic will face a Watford defence having scored or assisted in seven of his previous nine Gameweeks. The Hornets arrive at Old Trafford boasting just a single clean sheet since Gameweek 10. While Pep Guardiola may yet spring surprises with his teamsheet at AFC Bournemouth, Jesus appears assured to start as the central striker or perhaps out wide. Regardless of role, his talent and form has to be backed for FPL returns against a Cherries defence that's shipped 22 goals in their previous eight matches.